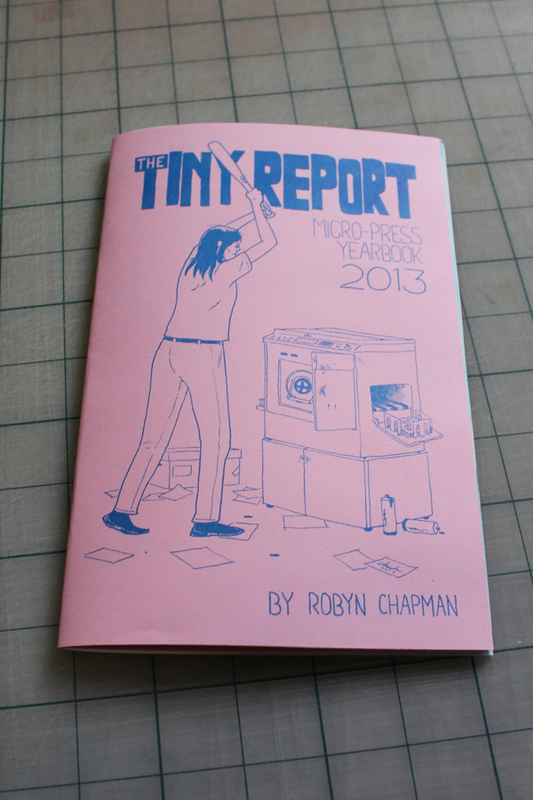 The Tiny Report is Back, The Micro-Press Yearbook is Here! 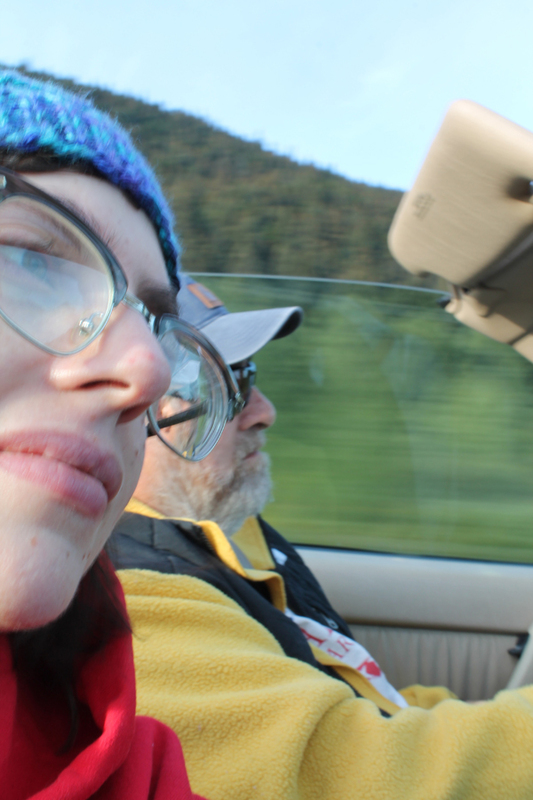 My dad and I took a road trip to go look at a glacier. The Dirty Dancing soundtrack was playing the whole way. It was awesome. 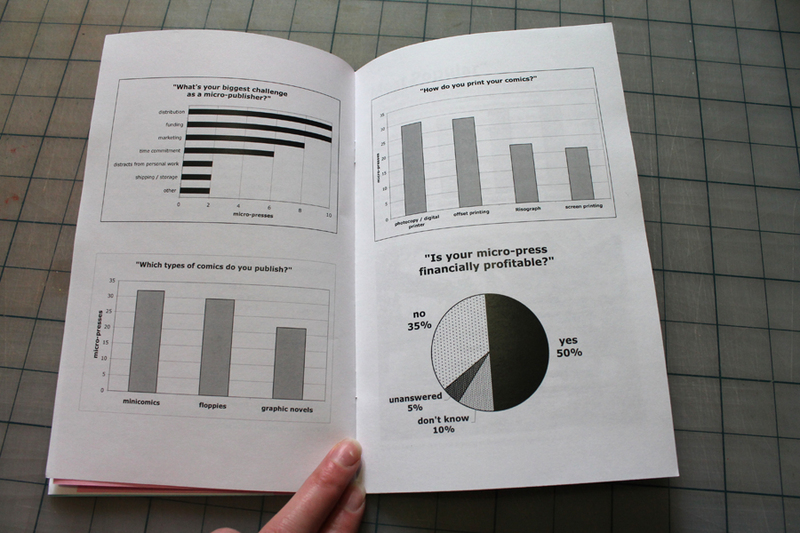 Excuse number 2: I was working feverishly on The Tiny Report’s first annual report: The Micro-Press Yearbook 2013. I really, really, wanted it to debut at SPX, and I made it just under the wire. Here’s the lovely cover by Chuck Forsman. It was Risograph printed locally by Jesse Hlebo (of swill children). He did a great job and his rates are quite reasonable. 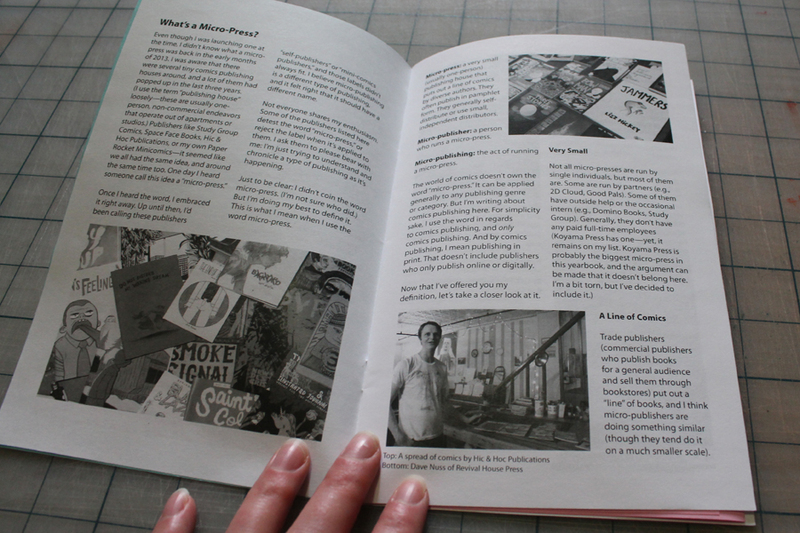 My essay “What’s a Micro-Press?” takes up about half of this zine. 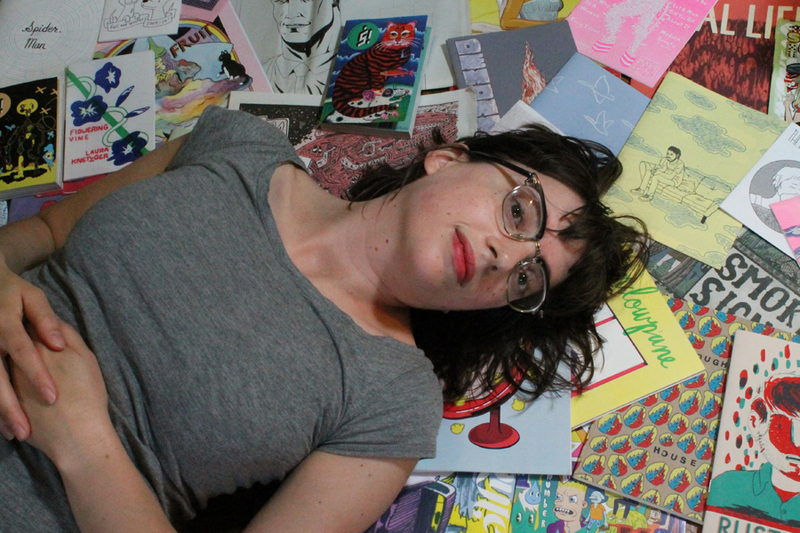 It’s also peppered with photos of micro-publishers and their wares, all taken during 2013. This is the double-sided centerfold. 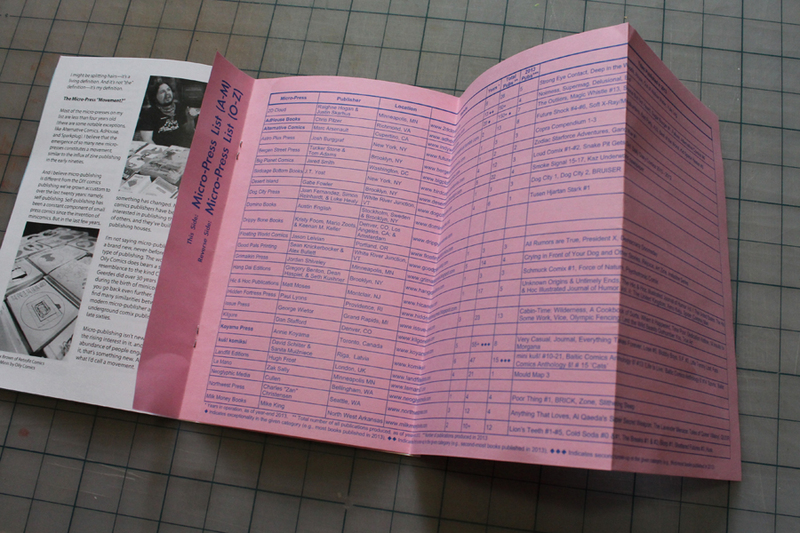 It’s basically a directory of all the micro-presses that I could find that were active in 2013 (there’s 52 of them). It includes this information: micro-press name, publisher, location, website, years in operation, total number of publications produced, number of publications produced in 2013, and the names of those titles. I was able to get complete stats on most of those 52 publishers. Here’s the back cover, with the complete 2013 list. I know it’s not a perfect list (some how I left out So, What? Press, and I’m kicking myself), but it’s pretty darn close, I think. So, that’s my zine. I’m pretty proud of it. Those of you who backed me on Kickstarter, You’ll be getting your copies in the next few weeks. Now that I’ve collected all this information, this site will need a bit of an overhaul. My list needs to be updated. My definition of a micro-press needs to be updated. And I’ll be posting some (but not all) of the stats and graphs that are in the Micro-Press Yearbook. Thanks for sticking with me, dear reader! Bonus: if you can name all the publications in this photo, I’ll send you a free copy*. Email me through the “Contact” link above. *I doubt anyone is going to take me up on this, but just in case: this is limited to a reasonable amount of winners. Say, ten. 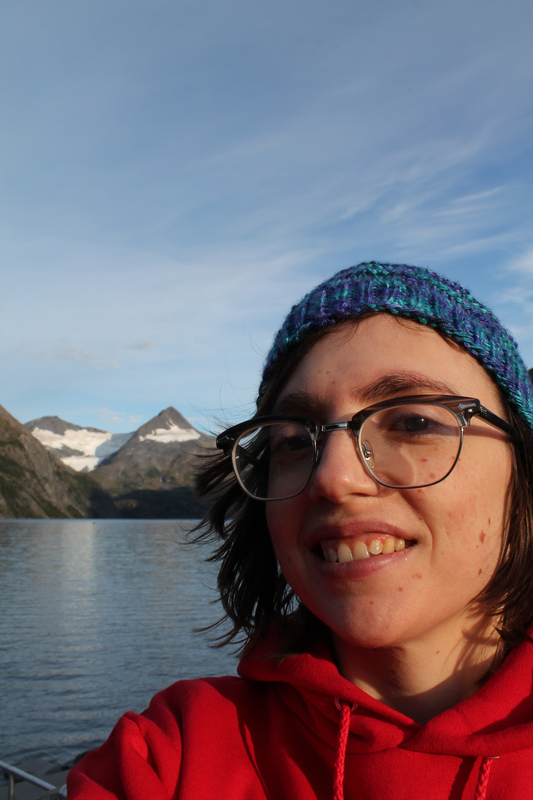 This entry was posted in Uncategorized and tagged Chuck Forsman, Jesse Hlebo, Micro-Press Yearbook, Paper Rocket, Risograph, zines. Bookmark the permalink.